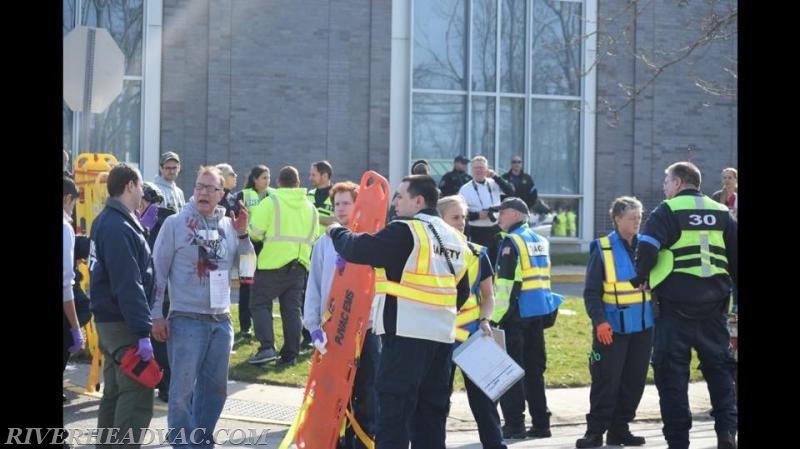 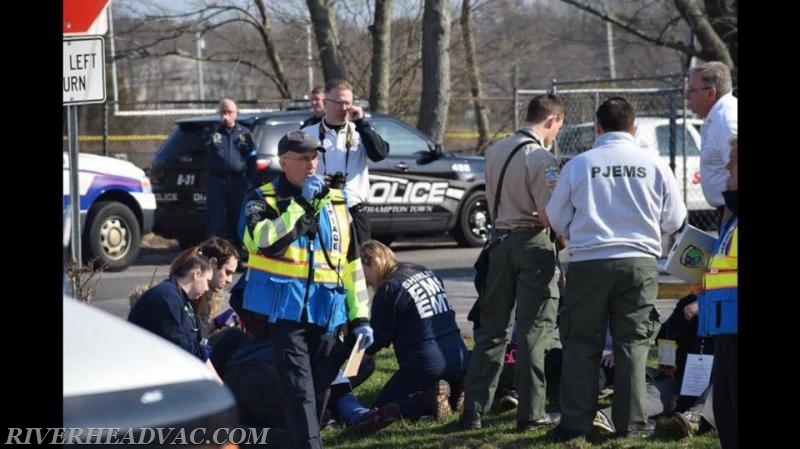 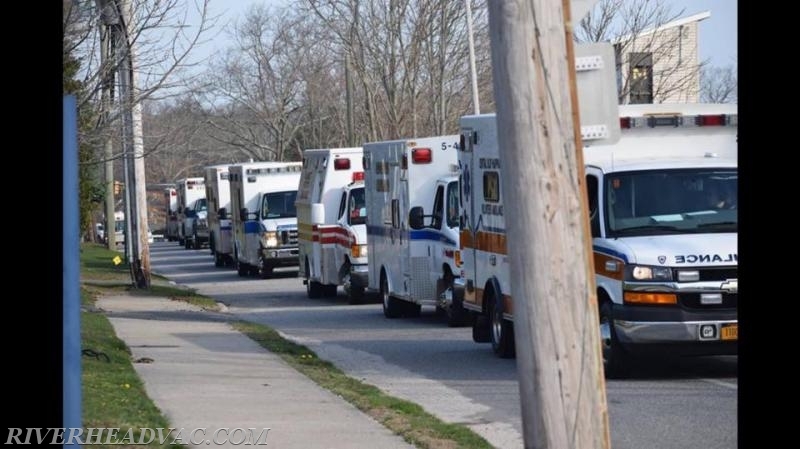 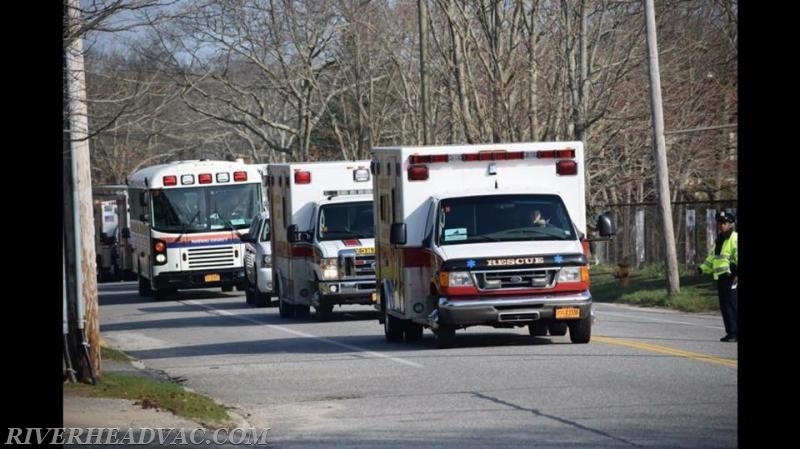 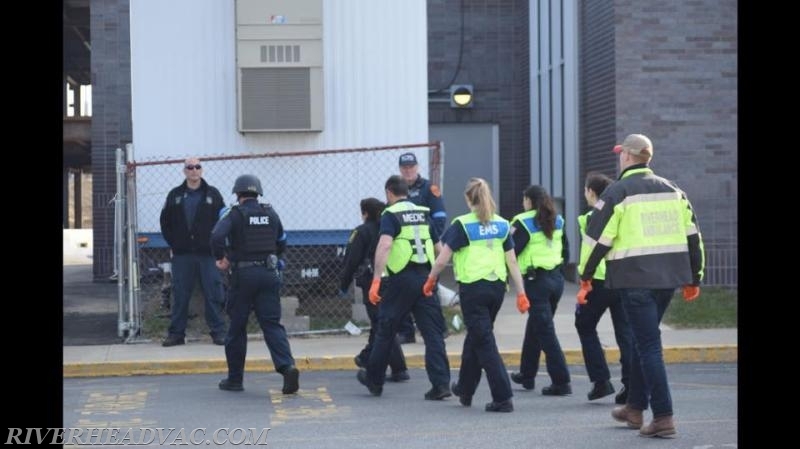 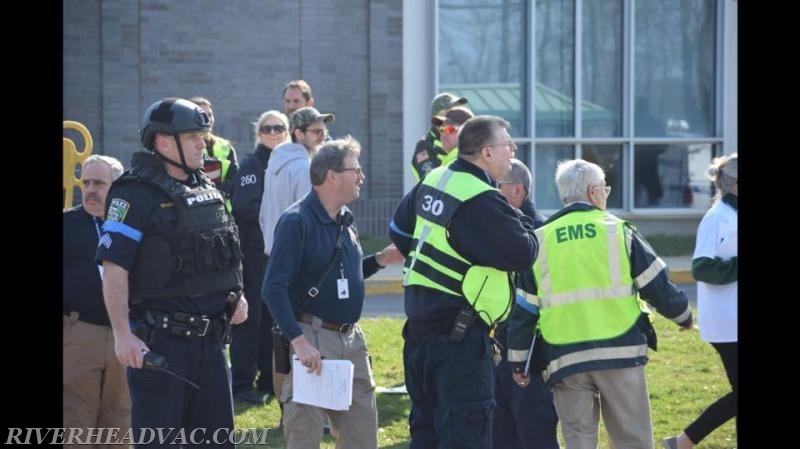 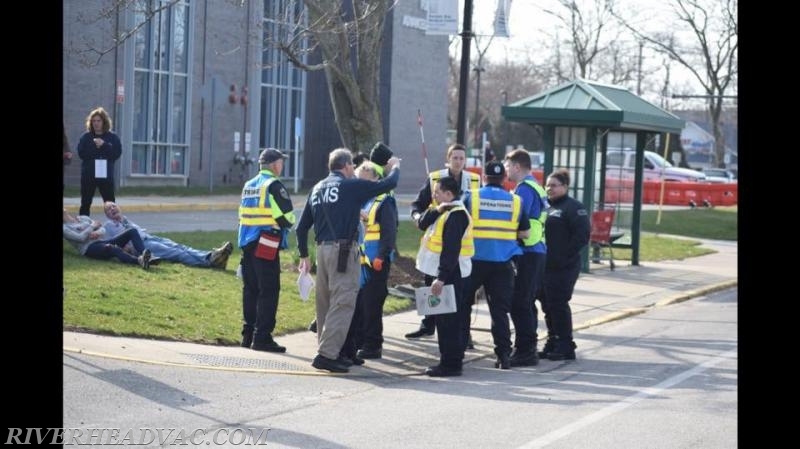 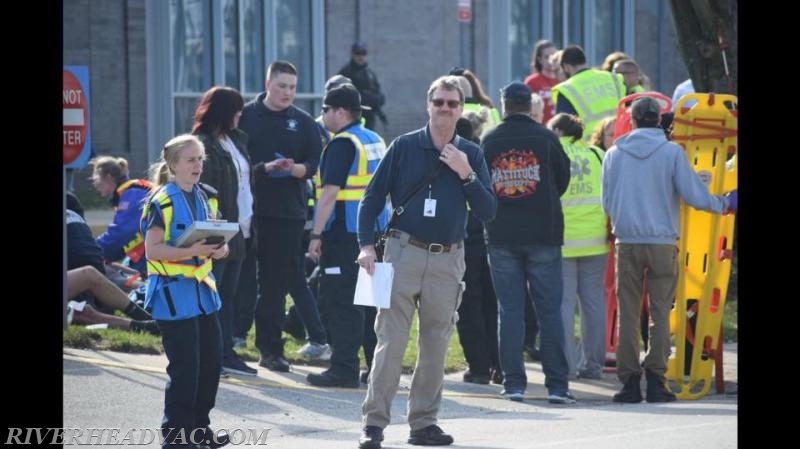 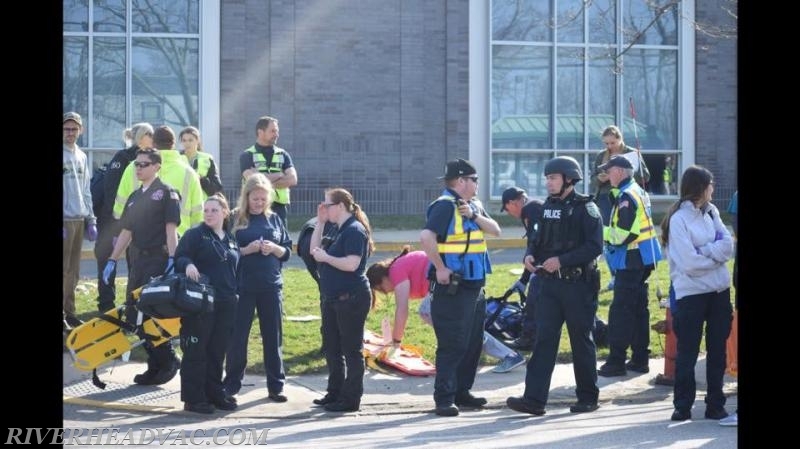 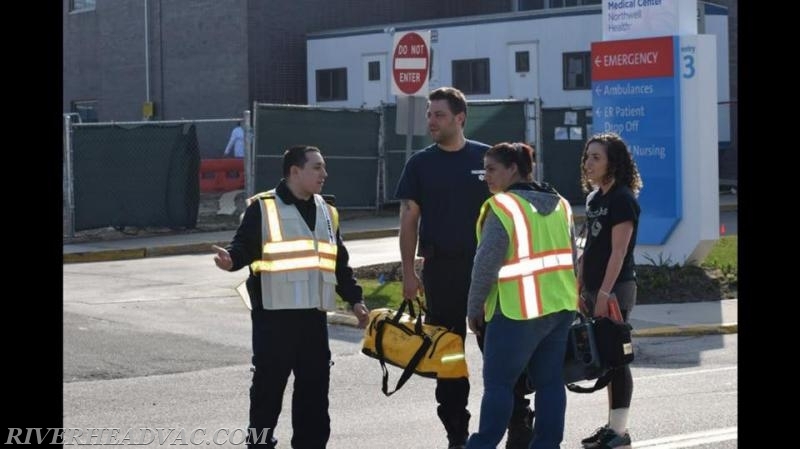 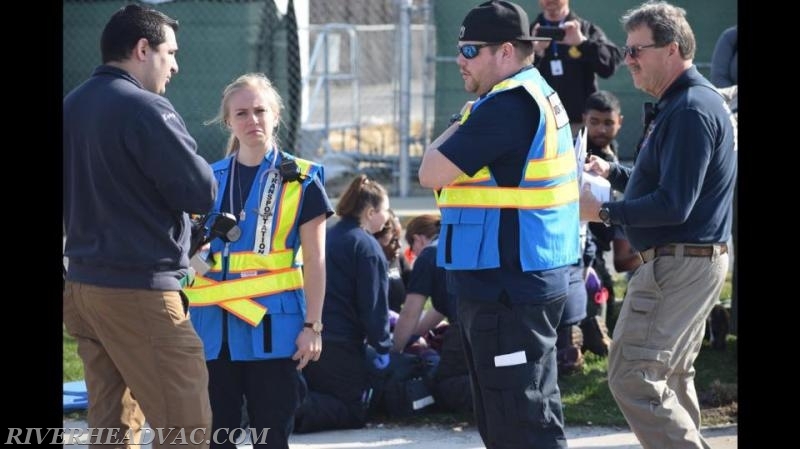 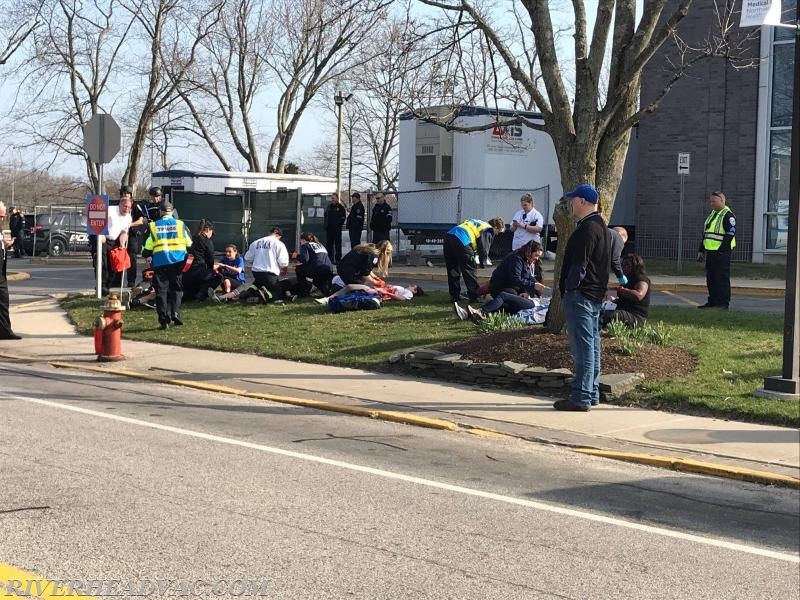 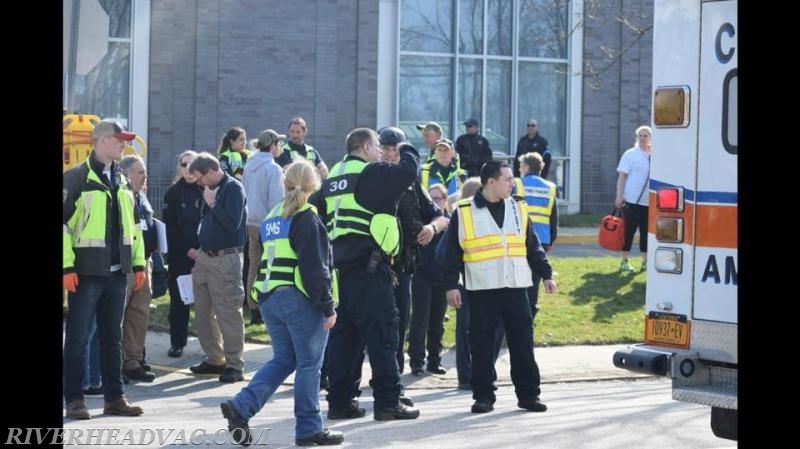 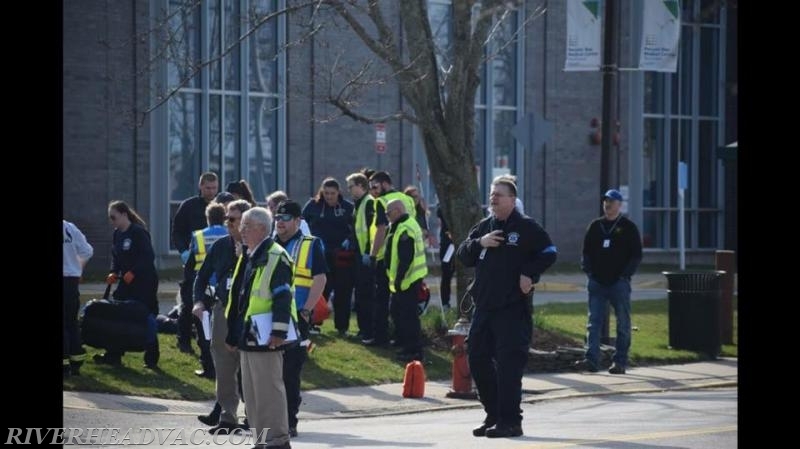 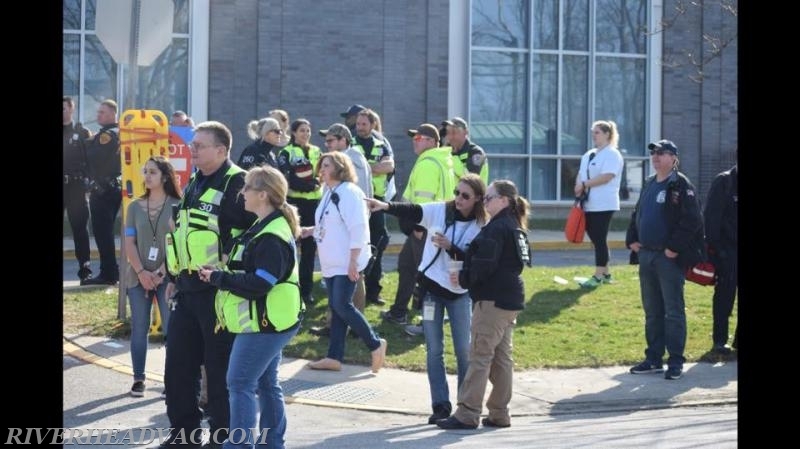 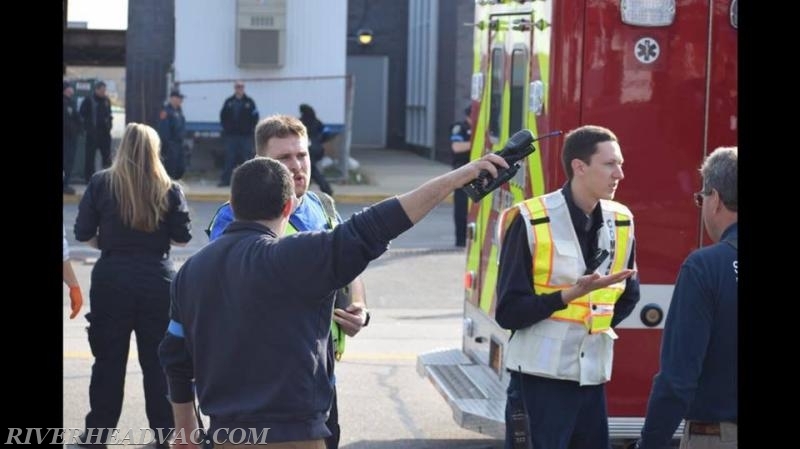 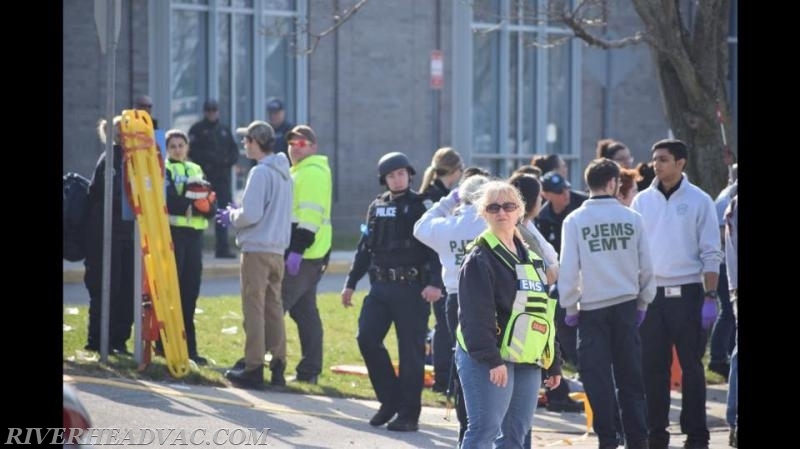 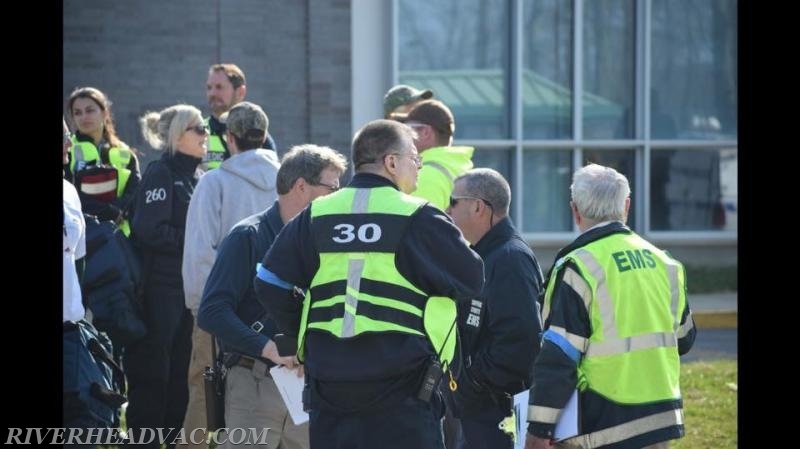 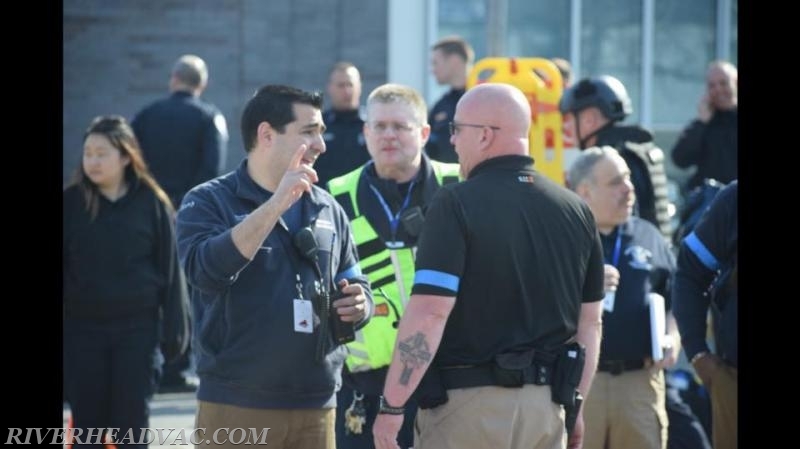 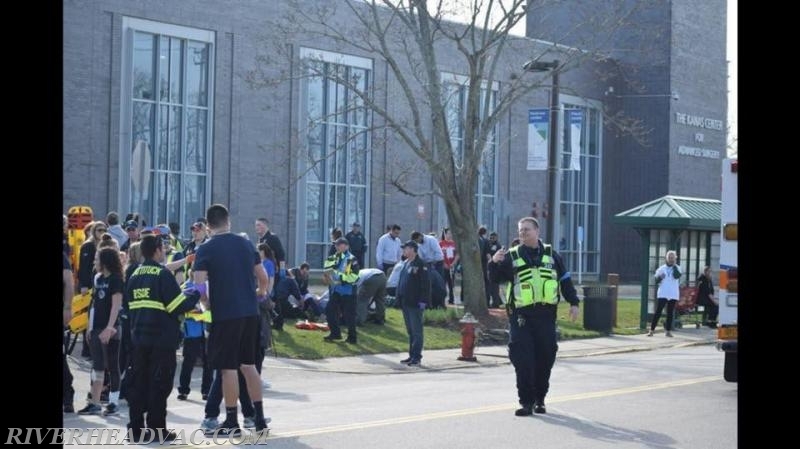 Active Shooter Drill Conducted at Peconic Bay Medical Center - Riverhead Volunteer Ambulance Corps, Inc. 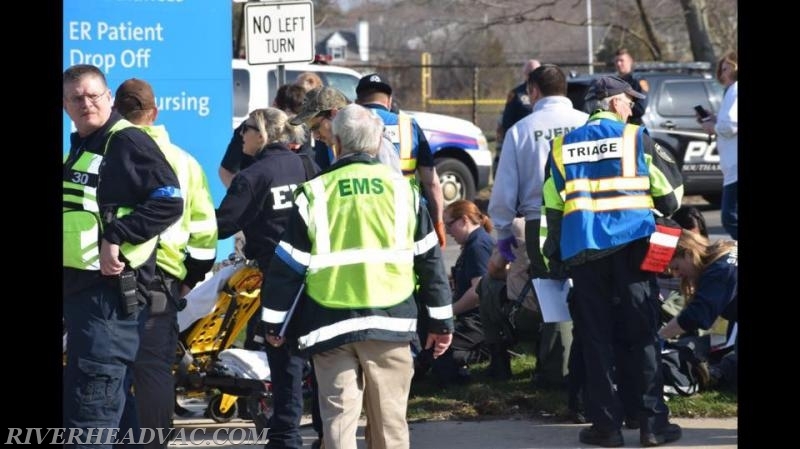 In an age when mass shootings are in the news on an increasingly regular basis, law enforcement, emergency services and hospital personnel have to be prepared for tragedies of unthinkable proportions. 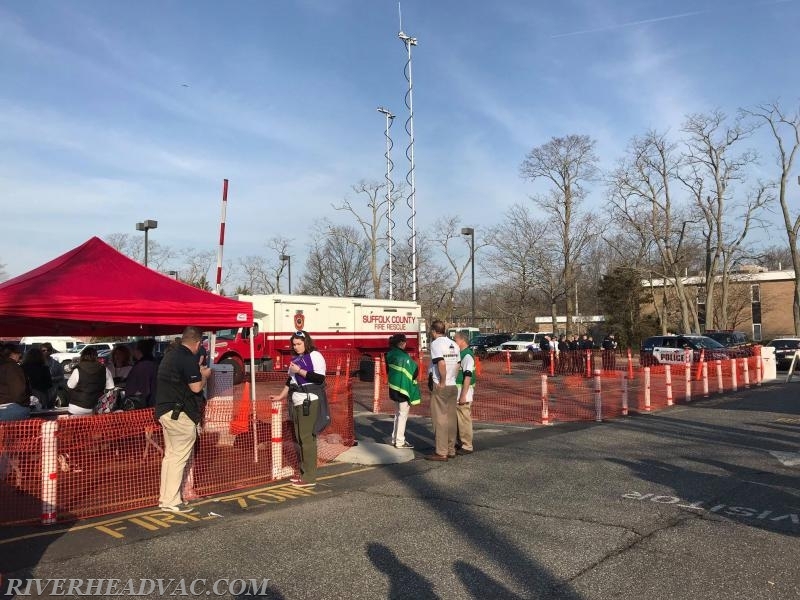 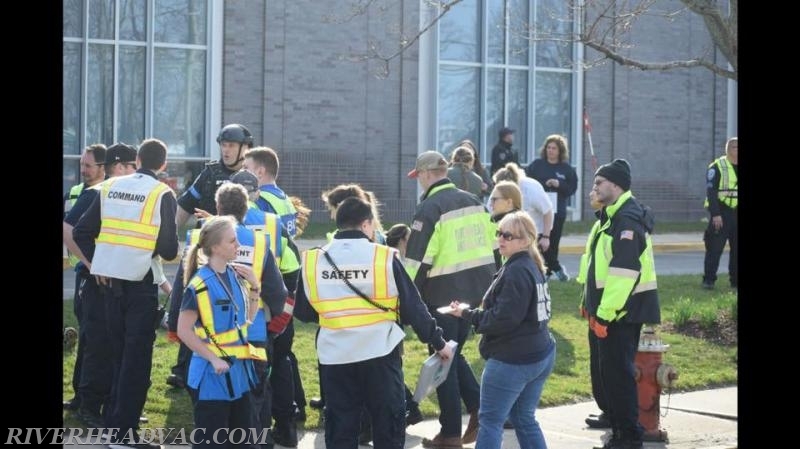 On Saturday April 14, Riverhead Volunteer Ambulance Corps participated in a multi agency active shooter drill held at Peconic Bay Medical Center. 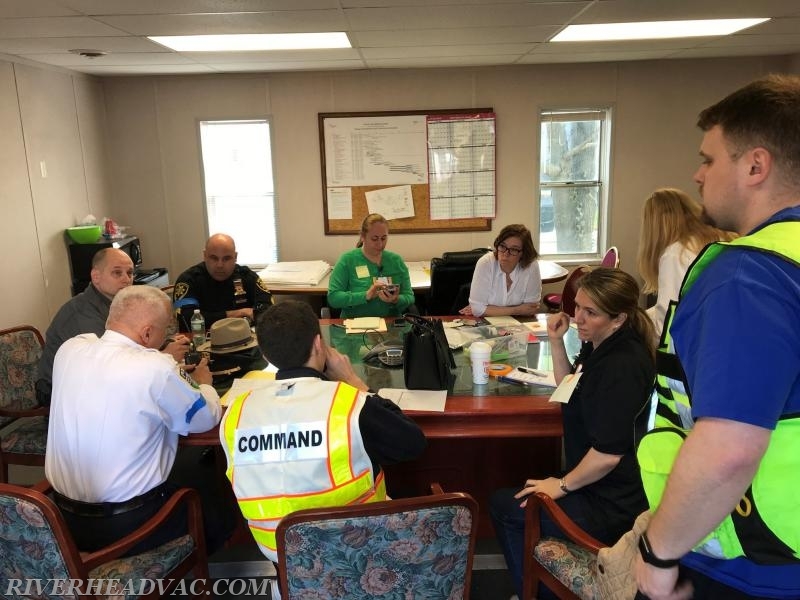 RVAC played an key role in the development team that spent over a year putting this exercise together. 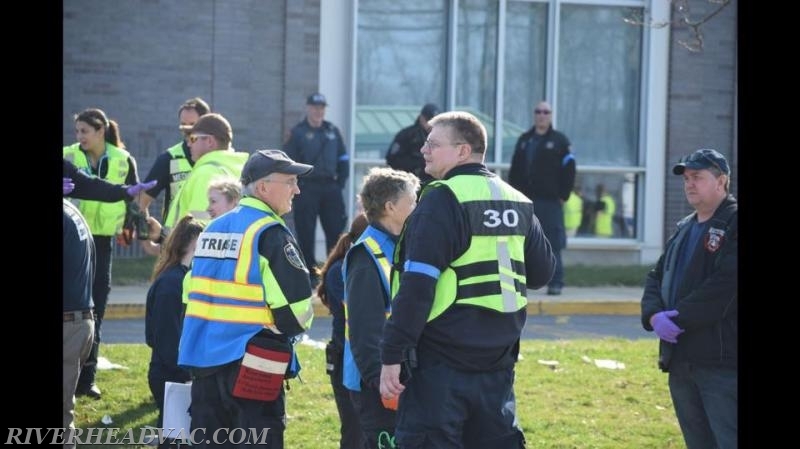 There was approximately 24 vehicles from 21 agencies who responded with us in this important training exercise. 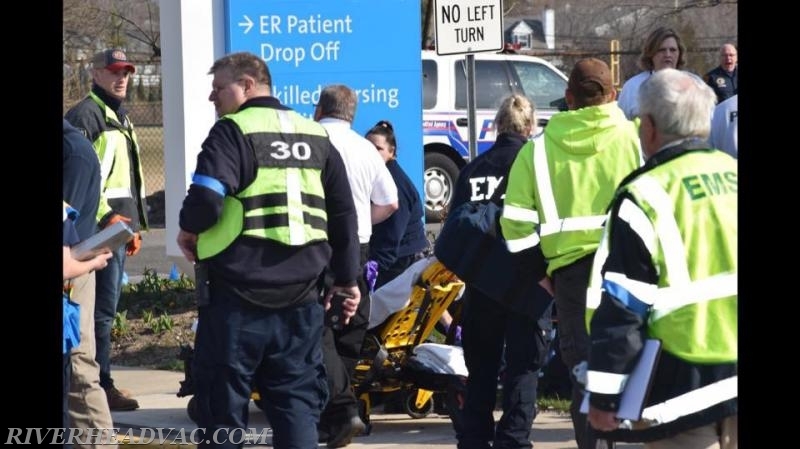 The scenario: A shooter armed with a Glock 9mm handgun enters the emergency room and opens fire. 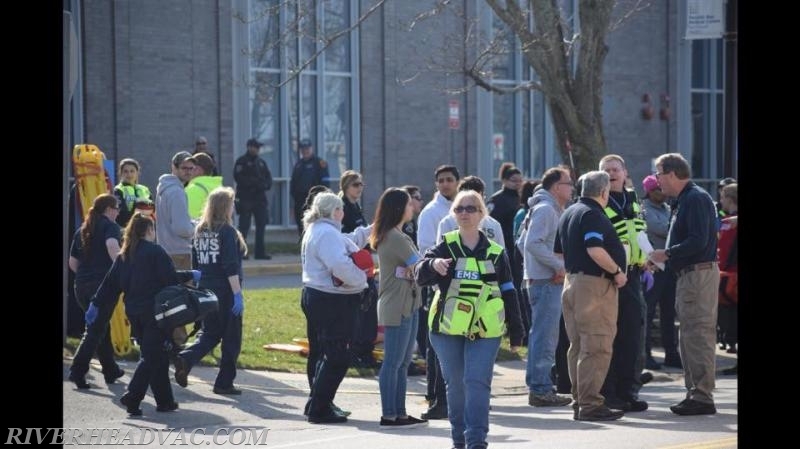 Within three minutes, 25 people including patients and staff are shot and injured, some seriously. 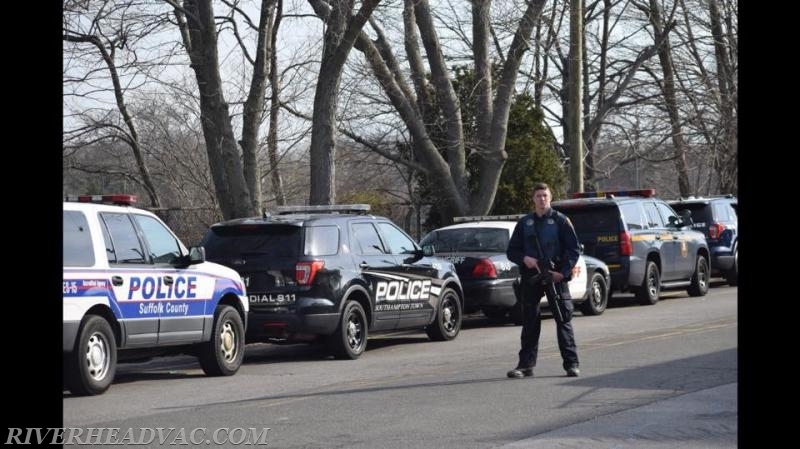 Riverhead Town Police respond to the scene in less than a minute, locate the shooter in the hospital and shoot him dead. 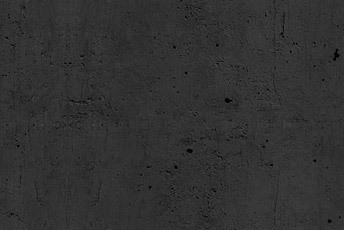 He is the only fatality. 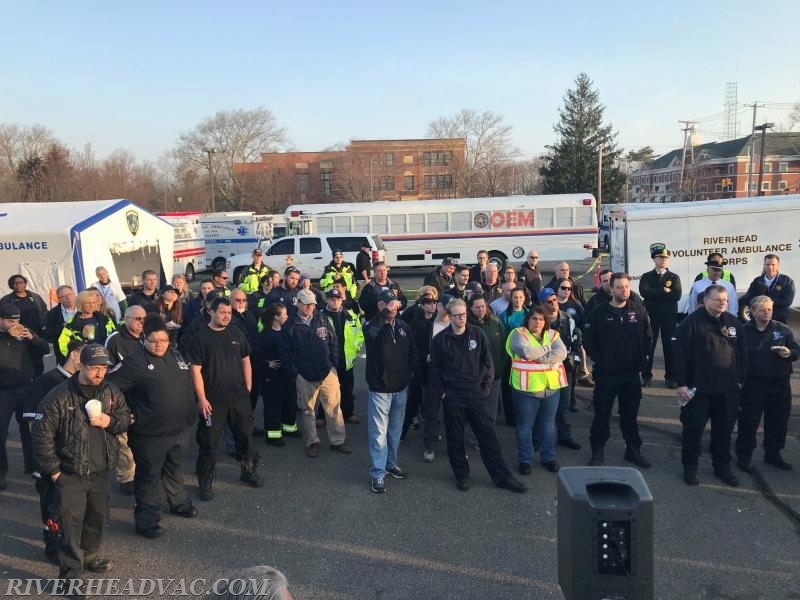 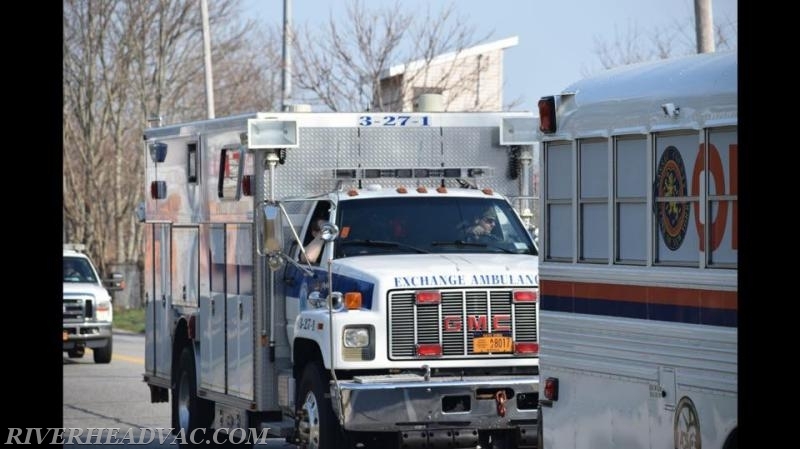 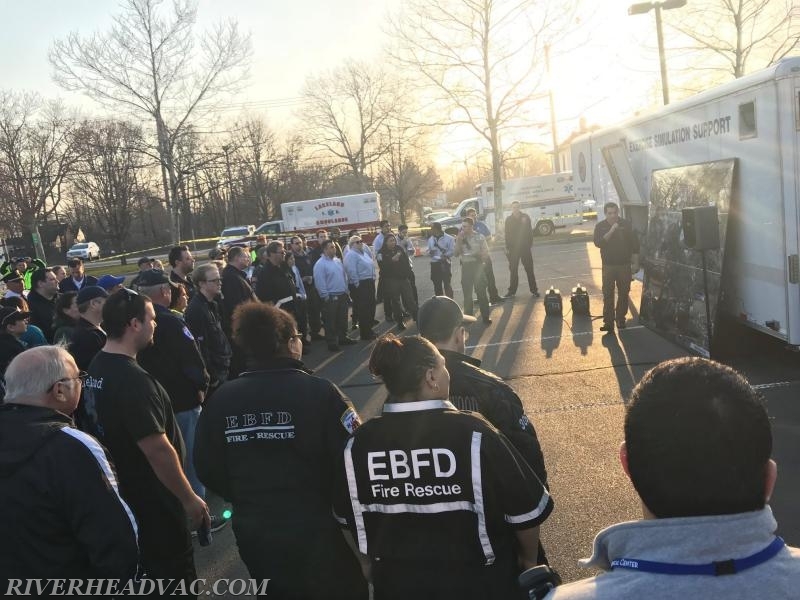 EMTs from Riverhead Volunteer Ambulance Corps and departments from all over the county descend on the hospital where victims are triaged, treated, stabilized and packed into ambulances for transport to other area hospitals. 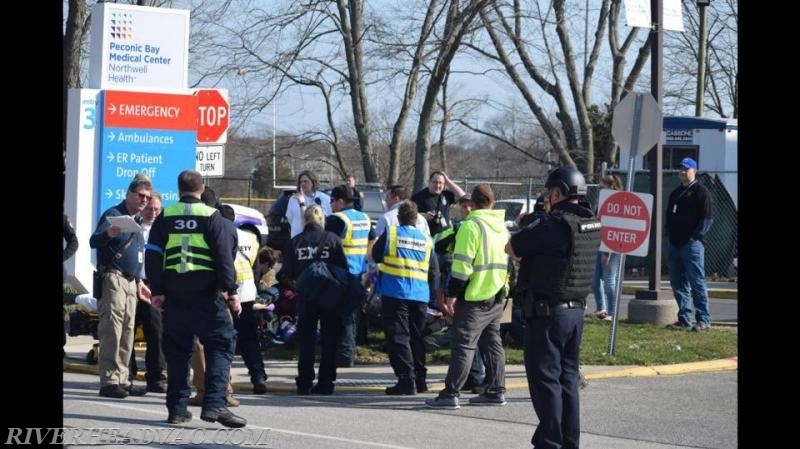 A few of them are taken to a landing zone at Riverhead High School where Suffolk County Police helicopters pick them up for a flight to Southside Hospital or Stony Brook. 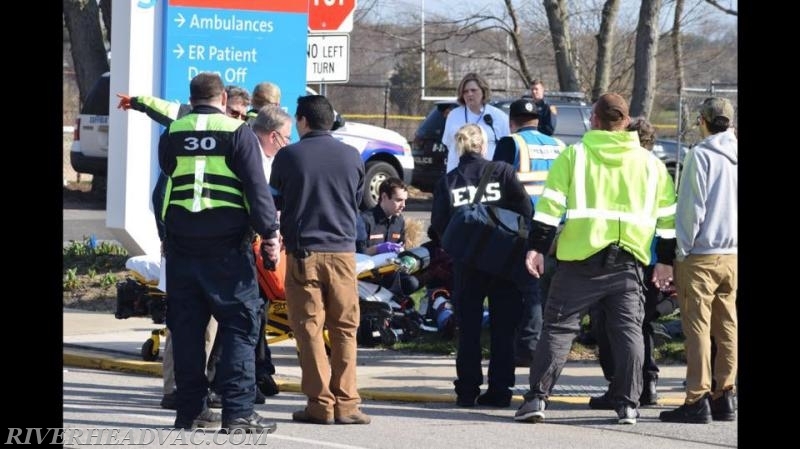 On behalf of Chief Rod Richardson, Riverhead Ambulance would like to extend our utmost thanks to all the departments who responded and participated as well as staff of PBMC. 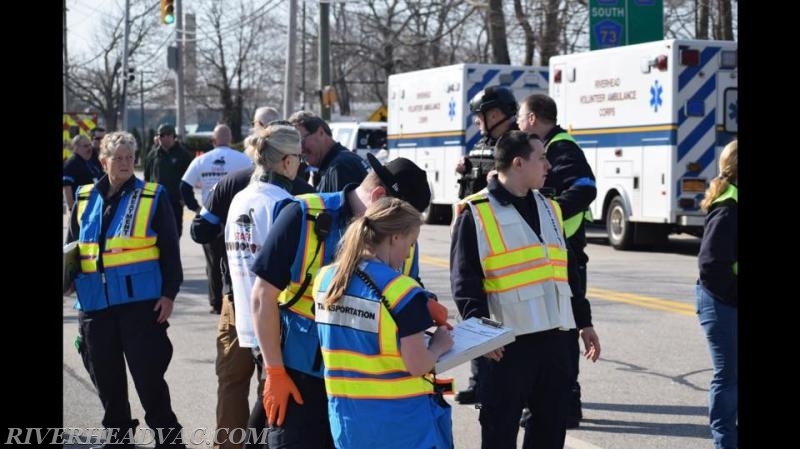 Special thanks to Frank Sarno from Shirley Community Ambulance for providing photos that captured the days events.